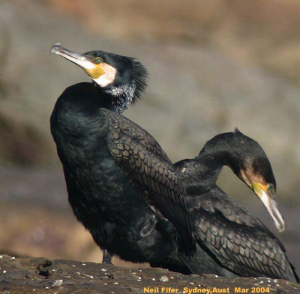 Cormorants or Shags are expert fisher birds and are used in oriental countries to catch fish for human consumption. Cormorants must dry their feathers, because they have not successfully achieved water-resistant qualities with their plumage, as have for example, ducks. More common is the Little Black Cormorant, phalacrocorax sulcirostris. Fish is their main food source, usually procured by diving under water. Food also consists of Fresh water crayfish (yabbies). The nest is an almost flat platform of sticks, aquatic herbiage and debris. It is a colonial builder, nests being placed on horizontal branches of trees. Three to five bluish-white eggs are laid. The eggs are often thickly encrusted with lime. The breeding season is July to October.